Zaun has been recognised by contractors Morgan Ashurst for achieving ‘Perfect Delivery’ on its range of fencing solutions supplied as part of the £44 million re-development of Suffolk New College. The fencing solutions specialist provided its market leading Duo6 fencing system and gates for the perimeter of the college. 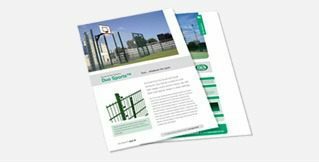 Combining robust design with a low visual impact, the Duo range offers a high level of vandal resistance and is one of the most economical fencing solutions on the market. Paul Painter, MD at Zaun, commented: “A key requirement in the tender process for the perimeter fencing was the ability to supply high quality, cost effective systems and deliver them to a strict deadline. This was because the work was being carried out in a live environment, therefore any disruption to the school or the local community had to be kept to an absolute minimum. Morgan Ashurst was awarded the £44 million contract to develop the state-of-the-art college, which is located in central Ipswich and replaces the college’s original buildings. Suffolk New College includes a performance area, hair and beauty studio, engineering and construction workshops, IT suites, creative arts and media areas, general teaching and training rooms and a food court.